The Expo is hosted and strongly supported by the 436th Comm Squadron at Dover AFB. Dover's Annual Expo is an effective way to make contact with the key personnel who make procurement decisions for Dover AFB. Dover AFB is home to the 436th Airlift Wing, known as the "Eagle Wing" and the 512th Airlift Wing, our Air Force Reserve associate--referred to as the "Liberty Wing." Together, these two wings make up the "Dover Team." The 436th Airlift Wing is the active duty military host unit at Dover Air Force Base, which provides command and staff supervision, along with support functions, for assigned airlift providing worldwide movement of outsized cargo and personnel on scheduled, special assignment, exercise and contingency airlift missions. The "Eagle Wing" is a subordinate of Eighteenth Air Force headquartered with the Air Mobility Command at Scott Air Force Base, Ill. The Eagle Wing consists of operations, maintenance, mission support and medical groups and 14 staff divisions. The wing has more than 4,000 active-duty military and civilian employees. A record turnout of 250 personnel attended the 2017 Dover event. This is the only technology event held at Dover AFB annually and is the way to make contact with personnel who influence and make technology purchases for the base. 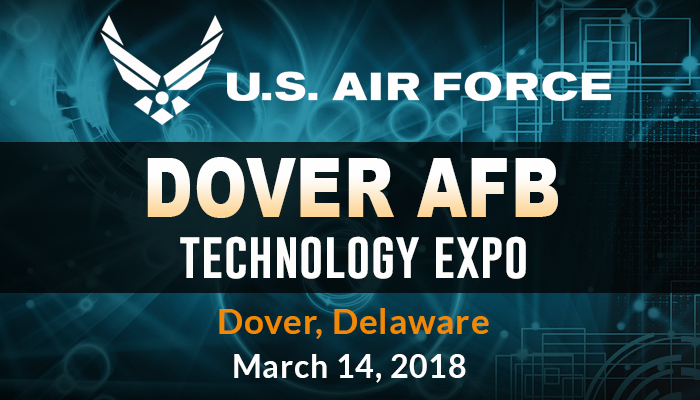 Vendors who participate in the Dover event also like to exhibit in the Joint Base MDL Technology Expo that is held the following day to maximize time in the region.